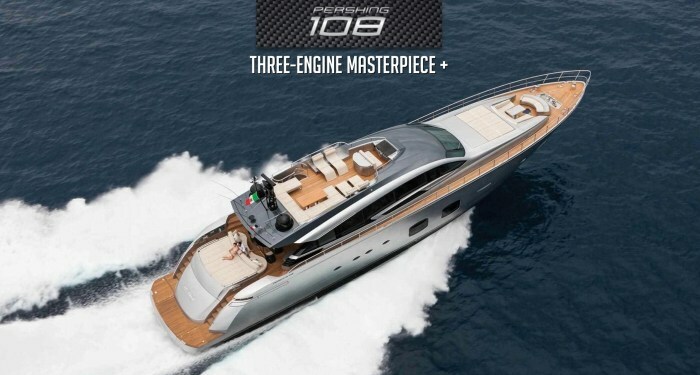 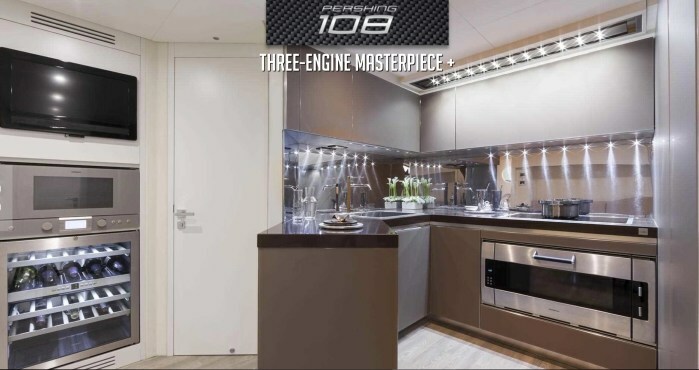 Pershing 108’, the latest of Pershing, was created from the established collaboration of the yacht Designer Fulvio De Simoni, the AYT (Advanced Yacht Technology) of the Ferretti Group and the team of architects and designers of the Centro Stile Ferrettigroup, and has a versatile layout and on-board innovative technology, which make it a model ahead of its time. 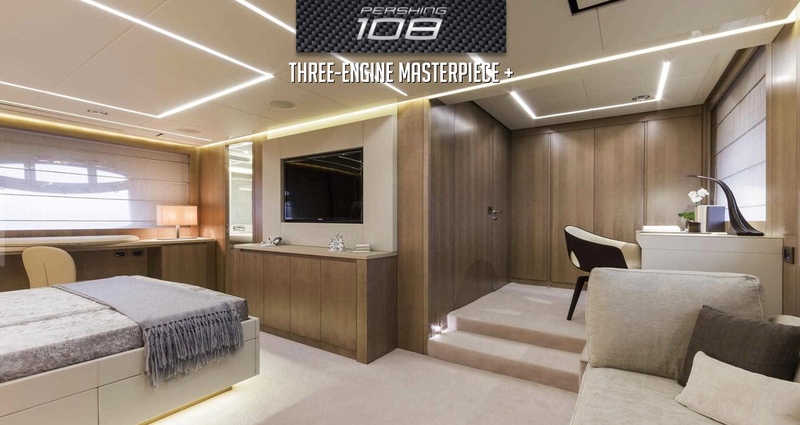 A cutting-edge ship, not only because of its layout and the on-board technology, but also for its motorization, which for the first time is split into 3, with the objective of ensuring high performance while being considerate to the environment. 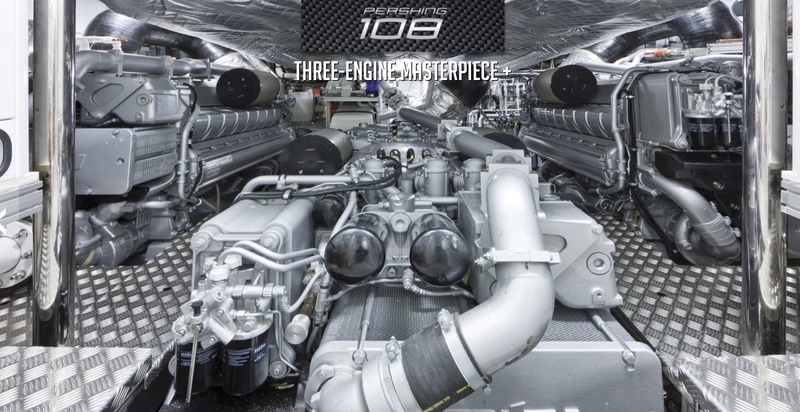 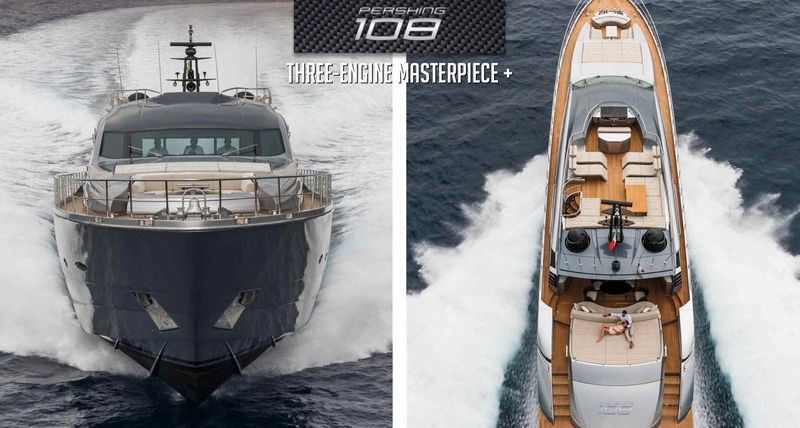 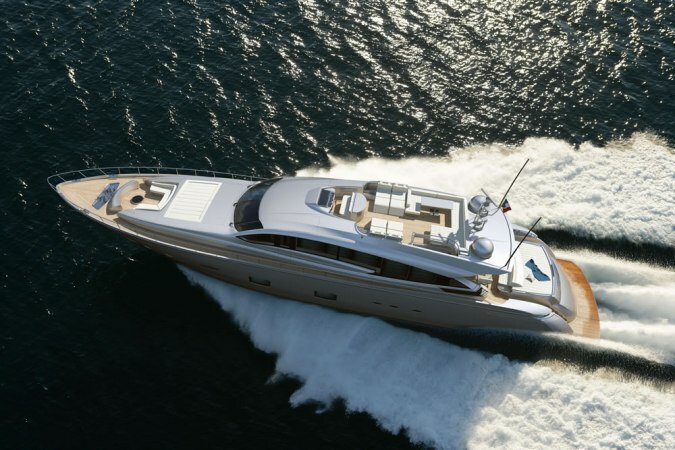 In fact the standard version of Pershing 108’ has three MTU 16v 2000 M 94 L diesel of 2638 mHp (1939 kW) and reaches a maximum speed of over 42 knots thanks to the three surface propellers. 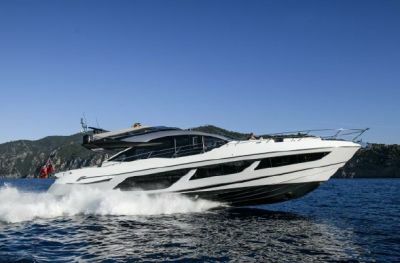 The boat possesses high movement ranges, exceeding 1000 miles at 10 knots, with extremely low fuel consumption even at those speeds. 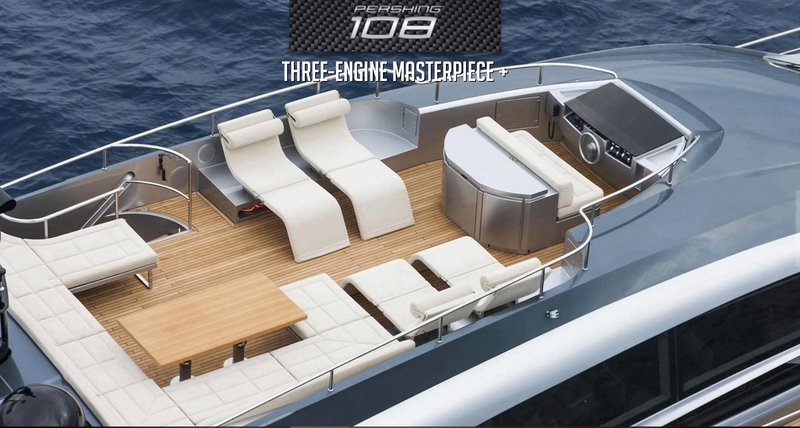 When only the central engine is functioning, the boat can move at low speed with great silence and one would hardly notice that it is on. 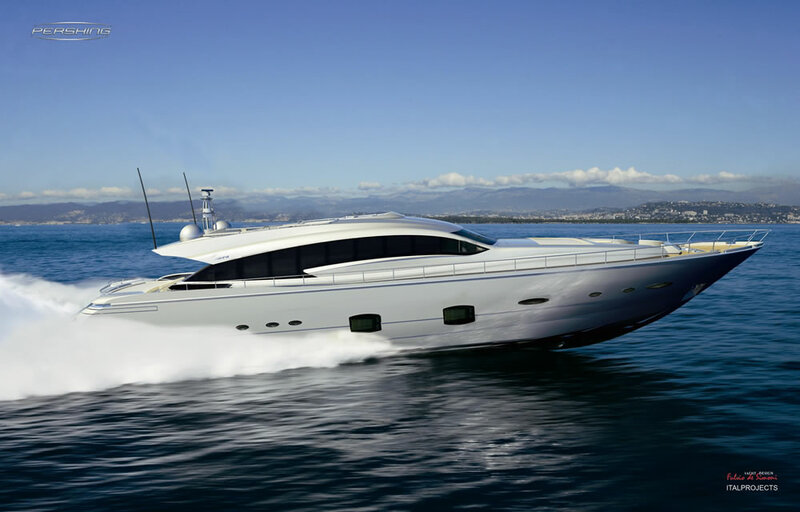 In the case of a light load, the boat can glide with only 2 engines and reach a significant speed, which is a very useful feature if there is a momentary failure. 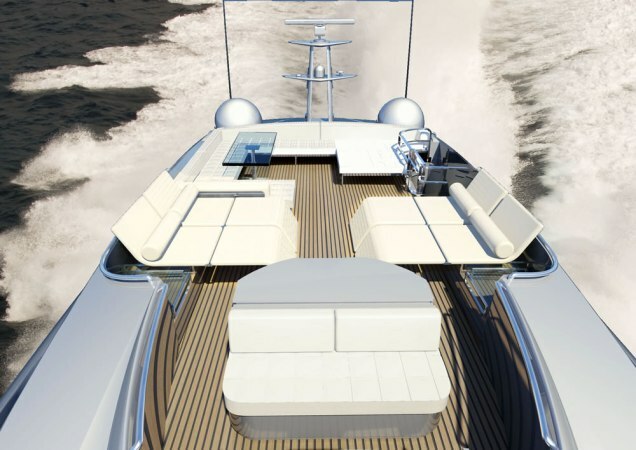 Generally, high levels of comfort have been realised, which translated in DNA represents a new benchmark for this category of boats. 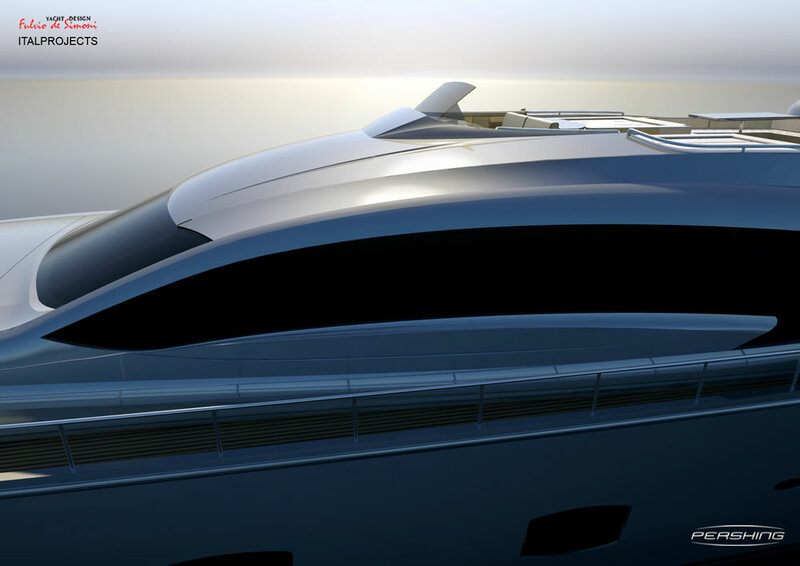 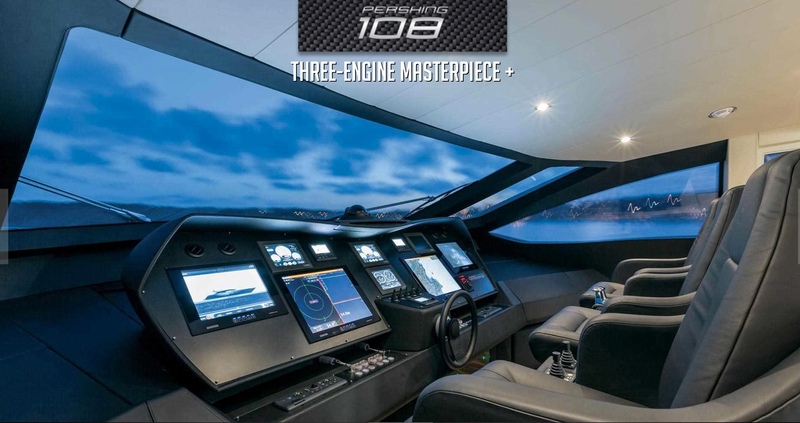 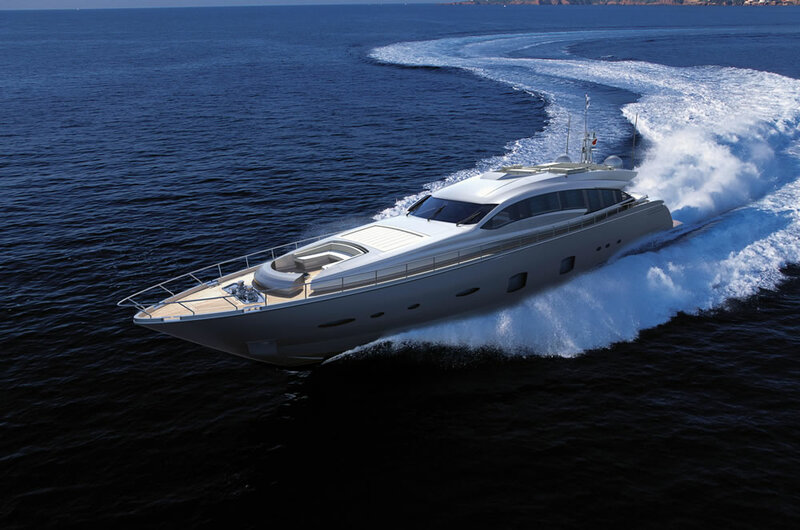 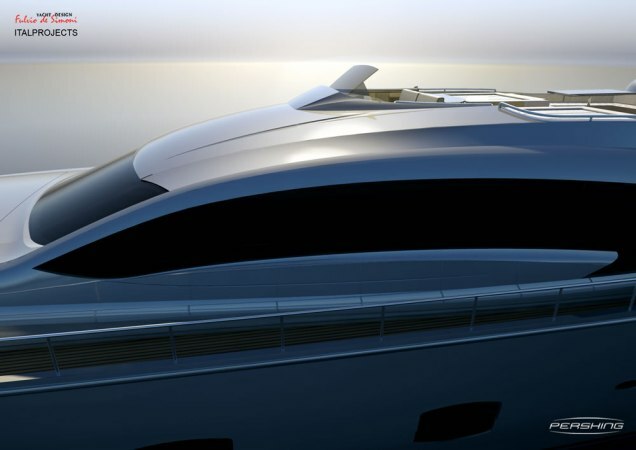 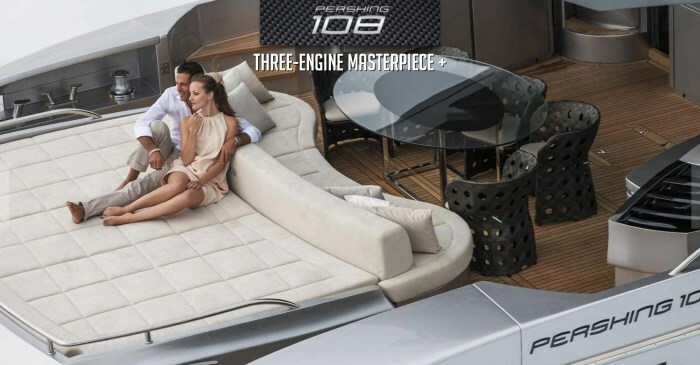 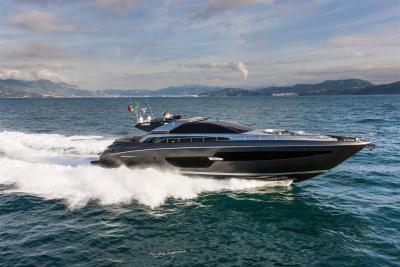 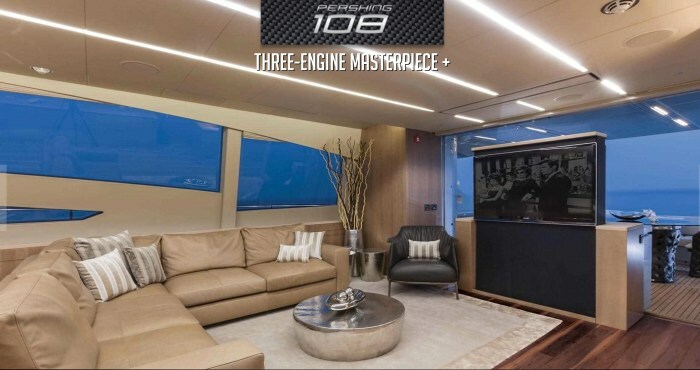 Performance of absolute prestige together with the usual “family feeling” that over the years has made all the models of the Pershing fleet unique and recognizable, combining the distinctive traits of the brand and the important novelties. 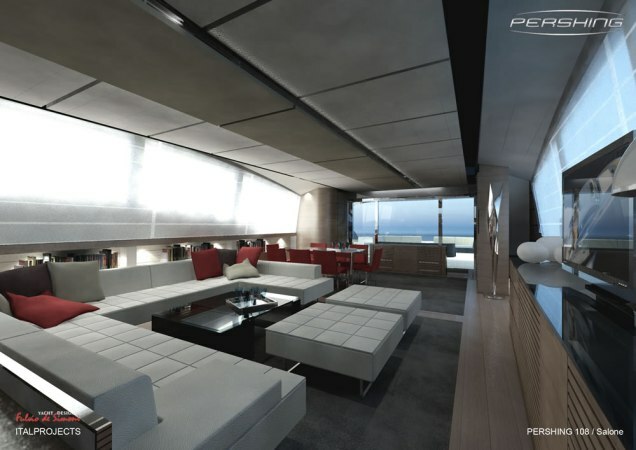 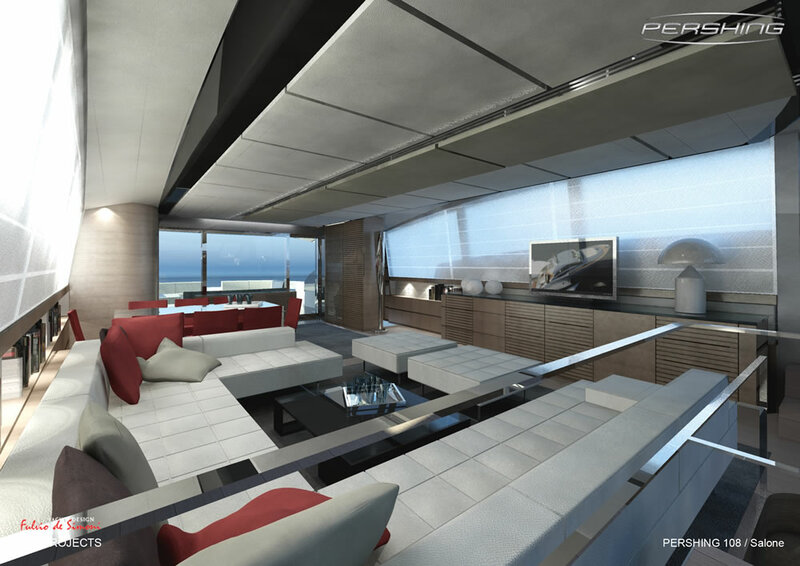 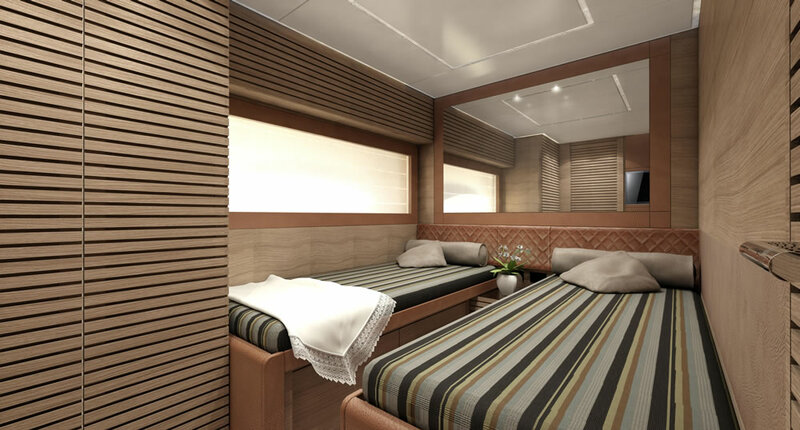 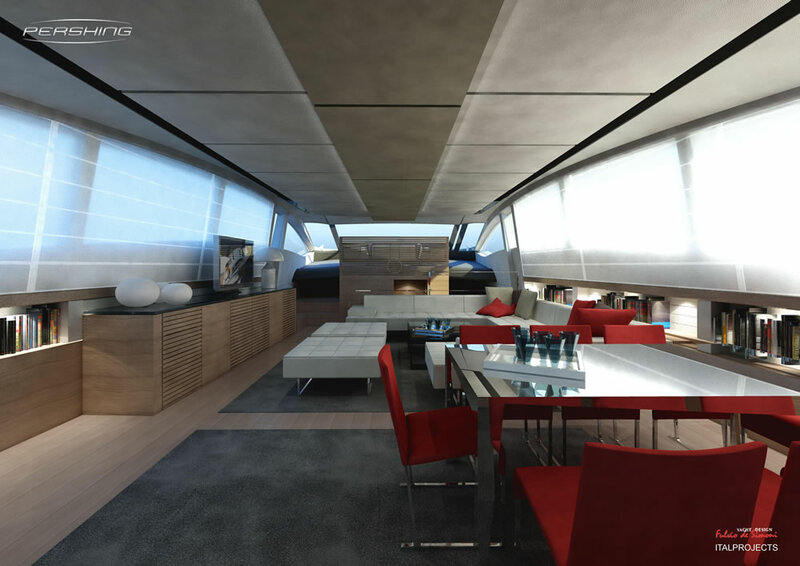 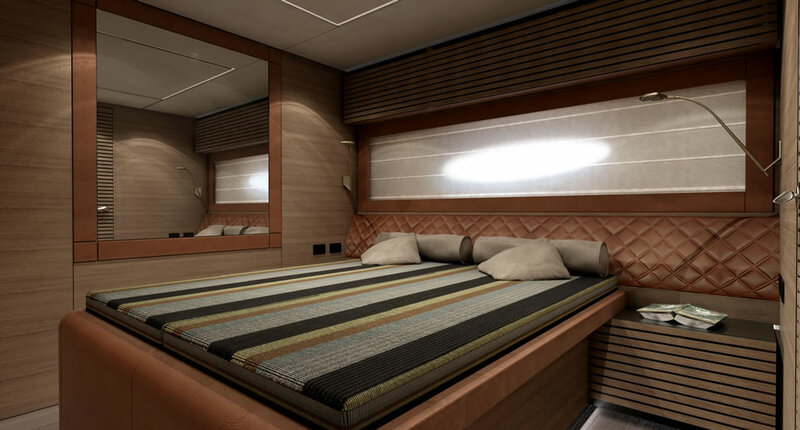 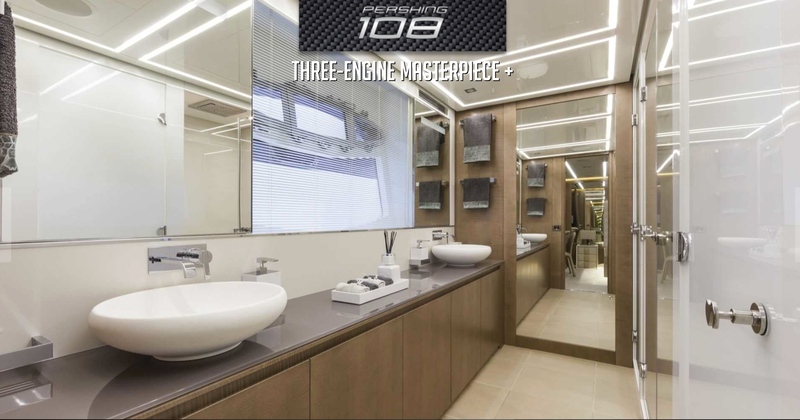 The standard layout of Pershing 108’, 32.90 m long, has 4 guest cabins and 3 crew cabins, providing the client with the possibility of choosing from the among the various internal layouts, with the aim of offering spaces that are more versatile and personalized. 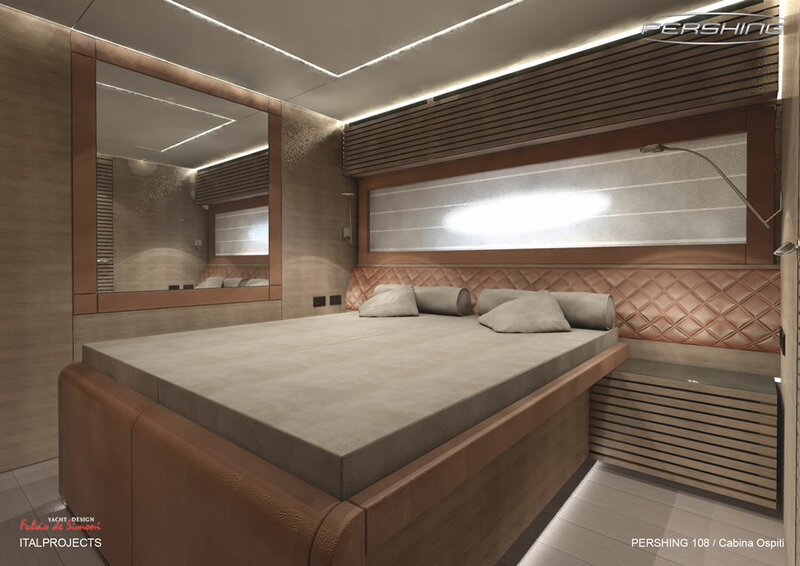 The owner and the guests become the real protagonists, thanks to a radically innovative layout, capable of offering spaces that diversify according to the situation. 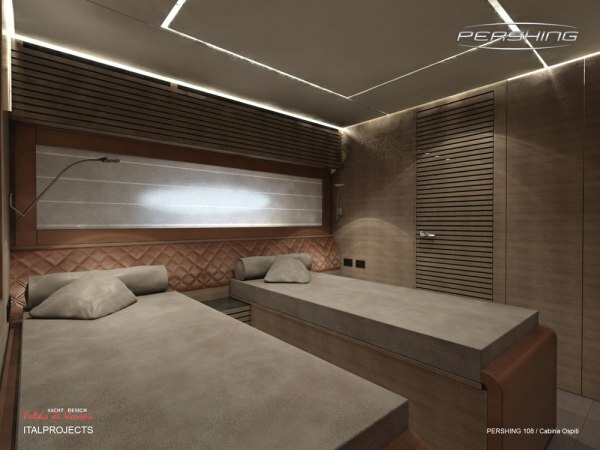 With this in mind, the first hull of P108’ has a completely personalized under deck layout including a spacious VIP cabin at the bow, a guest cabin, a TV or family room and a full beam master cabin amidships. 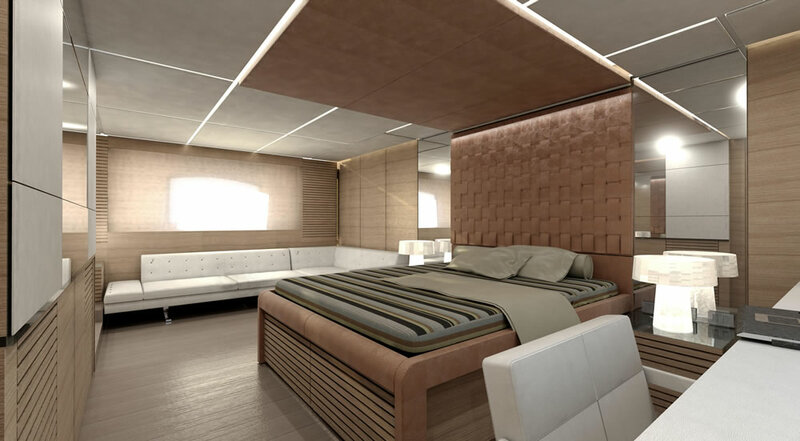 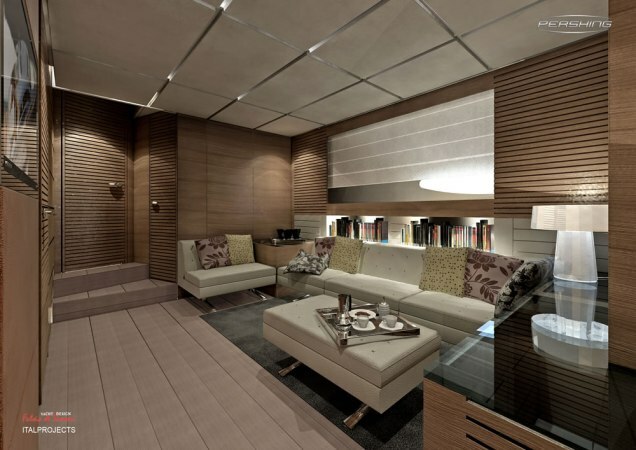 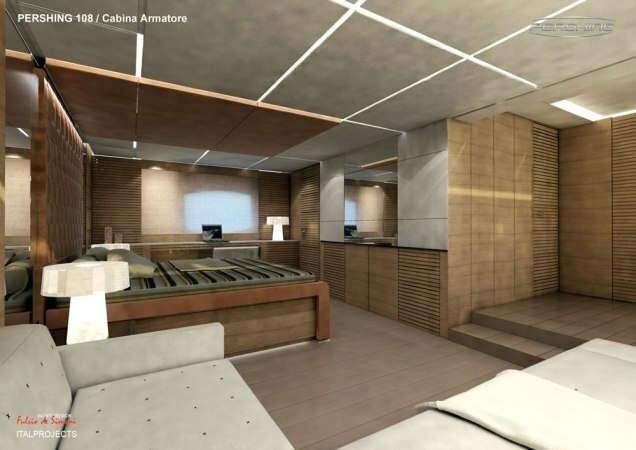 The elegance of the interiors has been attended to in detail by exceptional established partners such as Poltrona Frau and ErnestoMeda, besides the stylistically prestigious innovations desired by the ship owner who preferred solutions designed by Fendi Casa – Club House Italia and Armani Casa. We have for sale a Pershing 108 – 2011, please contact us at 514-521-1221 for all details. 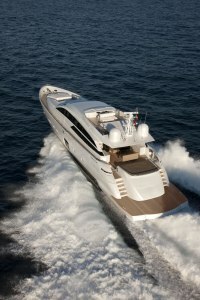 This Pershing is located in Florida.